With Halloween just a couple nights away, you may already be dipping into the candy bought for trick-or-treaters. Those bite-size spooky treats are certainly tasty, but when it comes to these seasonal treats, some are certainly better than others. Halloween candy is often loaded with sugar, fat, and calories. But you can make wiser choices and still satisfy your sweet tooth. 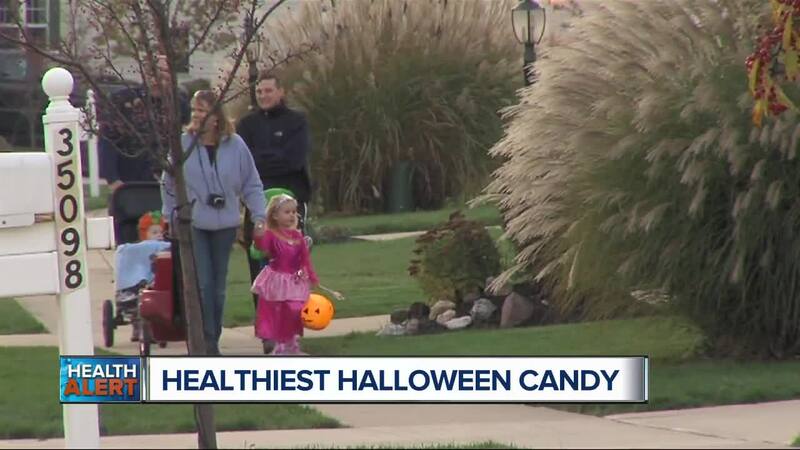 With Halloween just a couple nights away, you may already be dipping into the candy bought for trick-or-treaters. Those bite-size spooky treats are certainly tasty, but when it comes to these seasonal treats, some are certainly better than others. Halloween candy is often loaded with sugar, fat, and calories. But you can make wiser choices and still satisfy your sweet tooth. For instance, four pieces of Trolli Sour Brite Crawlers has 50 calories and 7 grams of sugar. They’re chewy, packed full of flavor and very satisfying. I also like the snack size Reese’s Peanut Butter Cups because they come with some nutritional benefits. One single cup has 110 calories and 11 grams of sugar. That’s a bit high, but it also has two grams of protein and one gram of fiber. Last on the healthier list is a lollipop. A Charms Blow Pop is 70 calories and 13 grams of sugar. I like that it’s low in calories and you’ll definitely get some long-lasting sweet satisfaction since lollipops can take a while to eat. Many of you are not going to happy to hear about some of these, but eating four little Kit Kat Minis gives you 170 calories and 17 grams of sugar. Tootsie Roll Minis are also high in empty calories and sugar. Four of them contains 150 calories and 19 grams of sugar. I’d say one of the least healthy Halloween treats out there is the colorful bite-size Candy Corn. One serving gives you 140 calories and a whopping 28 grams of sugar for only 19 pieces. Try to be selective about which treats you choose. If you can, choose ones that have some nutritional content like peanuts or cocoa. Don’t be deceived by the small size as you just heard they can still pack plenty of sugar and calories. And when you do eat candy, be very mindful and aware. Take your time to savor the flavor. You’ll be more satisfied and likely to eat less.